So my nubbins are still growing out, but with encouragement from a few people on my facebook page I have decided to keep working with them until they're back to normal anyway! Today I have another attempt at a stamping decal. I just feel with so many new gorgeous stamping plates (I got a bunch more in from Born Pretty Store this week on top of all the new MoYou London ones) I need to start stepping up my stamping game! 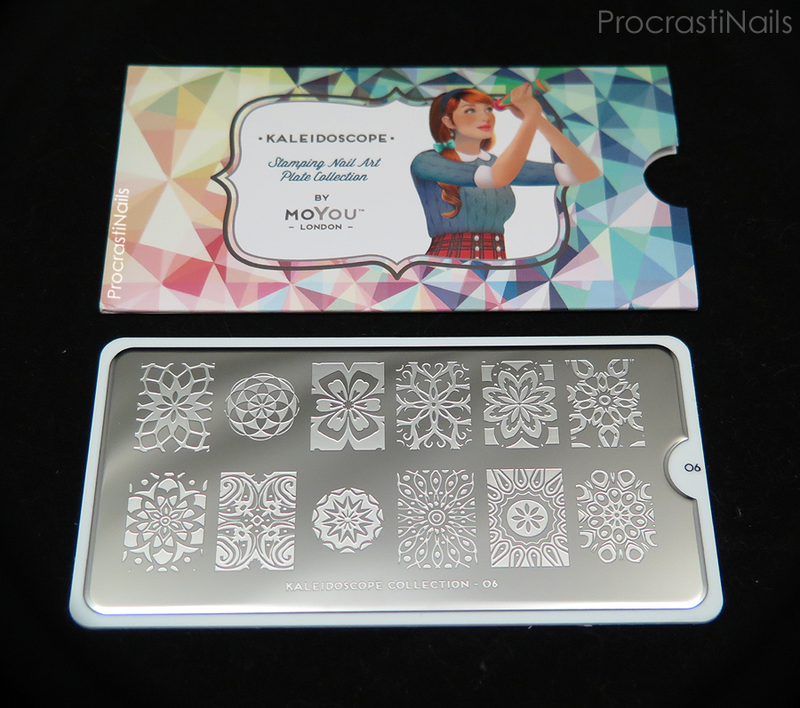 The plate I used today was MoYou London's Kaleidoscope 06 XL. I used one of the lovely individual mandala-like designs (the one in the top row). TECHNIQUE: There are a number of decal techniques but for the one I used today I picked up the design, painted in the decal while it was still on my stamper, let it dry fully, painted a very thin layer of quick dry top coat over the design on the stamper, let it slightly dry for exactly 1 minute and 20 seconds, and then stamped it on my nail over my (fully dry) nail base coat. With this technique it's tricky getting your timing right (too long and the design dries on the stamper, too quick and everything is still wet and smooshes) but I still found it much easier than all the other decal methods I've tried! Definitely going to work on this some more with more complicated designs. I wanted to go with some fun bright colours for this look, so on my accent nail I did a base of Essie Blanc and then did my stamping with Rimmel London Lasting Finish Pro Black Satin. The design was filled in with Julep Laree, Saaya and Lissa, and my remaining nails were painted with Black Satin and Laree. This used to be my go-to black but it's almost empty, and Rimmel London has discontinued the line. (*tear*) I've heard good things about stamping with Wet n Wild Black Creme so I'm going to give that a try next time and hope that it's a suitable replacement. Fingers crossed! So that's it for today! Let me know what you think about the look, and let me know what your favourite method of making stamping decals is! It's so interesting that a technique has so many different ways it can be done... I can think of 4 off the top of my head! I love WnW Ebony Hates Chris for my drug stores stamping black if the creme doesn't work out :). Love this design. That's good to know! I'll keep my eye out for that polish, too! Ooooh I just love this! The design and the color pairings! So beautiful! I love the colors that you used here!! Your nails look awesome!! 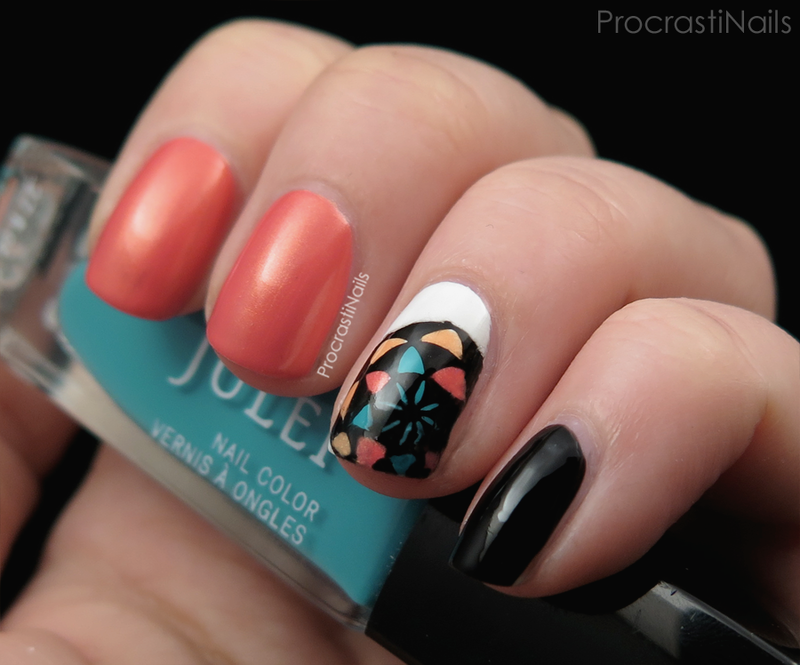 Gorgeous mani! I really like the nail art! This looks so pretty! I haven't tried that method for a decal. I always peel it off the stamper and then stick it on again. Looks like it worked great though! 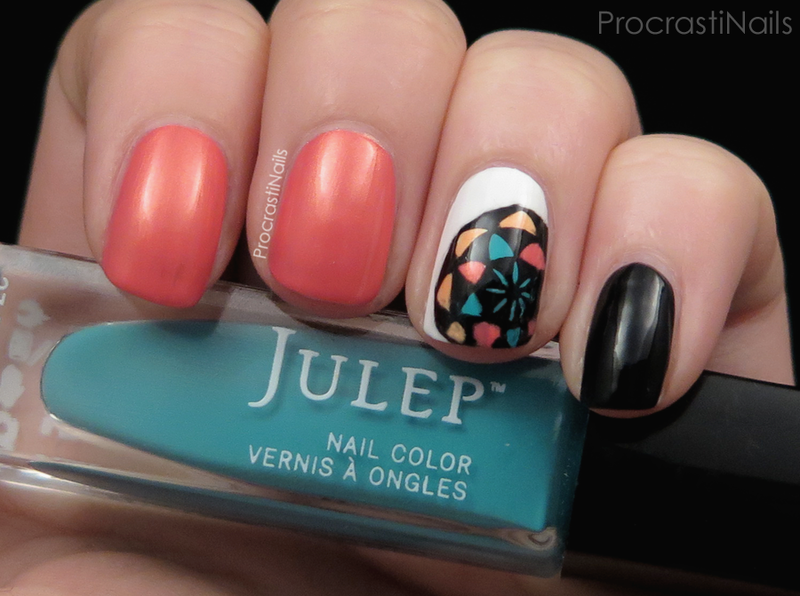 This is such a cool mani, the colours are so good together! Love your decal too! I love this look! And I'll try that decal technique for sure because it looks flawless :). I think I need this MoYou plate in my life! Very cool! I love this! I made some decals with this same plate this week! Very cool that you got a decal method to work! The timing sounds so tricky, but it came out amazingly well! This manicure looks so beautiful! Oh MoYou, how I want all the plates!! I'm in love with what you created and the color scheme! Another plate to go on my wishlist!! Looks great! I've been eying those Kaleidoscope plates too.